In a large frying pan, heat the oil and sauté the onion for three minutes. Incorporate the garlic and cook for a few more minutes. Then, add the yellow ají paste, tomato, oregano, bay leaf and achiote oil. Cook the mixture for five minutes. Next, pour in the white wine and let reduce. Afterward, mix in your preferred seafood, rice, cilantro, salt and pepper. The final mixture should look evenly combined and still be juicy when served. If you can’t find a good source of fresh seafood, you can use frozen seafood also. You can use a single variety or a mix of squid, shrimp, octopus, clams and mussels. To make achiote oil, heat one tablespoon of achiote grains in 1/2 cup vegetable oil. Maintain on low heat until the oil takes on an intense red color. Let cool, then strain out the grains. This oil can be used for dressing any meal. Within Peruvian cuisine, seafood dishes offer an array of colorful and sabroso rice creations that take advantage of the fresh daily catch. It’s very common to see, especially in the cevicherías, plates of rice–full of seafood or shellfish–as special dishes of their own. As you know, we love rice; it’s an indispensable accompaniment for the majority of our meals, but it is also the protagonist in many recipes, sweet and savory alike. This rice dish is best eaten fresh to enjoy the seafood in its entire splendor. Storing seafood or even reheating it is not recommended, even though this is commonly done in other preparations. A while ago I learned that restaurants don’t always cook rice together with seafood, since they don’t have the same cooking times. In this case, cooking together would result in seafood that’s tough and chewy. 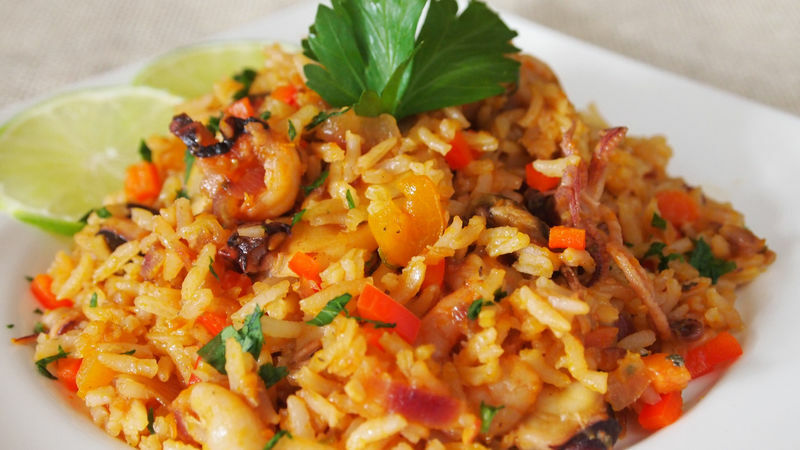 When prepared separately, the results are perfect: the rice remains ‘al dente’ and the seafood is tender. More vegetables can be added to the rice as well to give it even more color. I promise you the dish will turn out beautifully as well as delicioso!